Arbor teas from ancient tea trees in Xiengkhouang und younger plantings on Bolaven-Plateau, Laos. Handpicked and traditionally processed artisan teas from one of the cradle countries of the tea tree. Bolaven Silver Cloud is a white silver needle tea (picking standard: pure buds) from south Laos. The seed-raised, up to over 70 years old tea trees grow in a semi-wild, biodiverse tea garden near Phonsavan on Bolaven-Plateau. The processing to a true artisan tea is mainly done by hand. At this, the light roasting that is rather untypical for white teas distincts Röstung Bolaven Silver Cloud both from Fuding white “silver needle” teas and from Yunnan “White Moonlight Buds” – also in taste! Bolaven Silver Cloud Sticky Rice White Tea is a white silver needle tea scented with the Southeast Asian “sticky rice” herb. The basis tea grows in the fertile volcanic soil of a semi-wild, biodiverse tea garden in Paksong, Bolaven Plateau, south Laos. The sticky rice herb, “Nuo Mi Xiang Nen Ye”, is for example also used to scent tea leaves in Yunnan and north Thailand. The combination of the white tea buds’s taste and the aroma donor’s flavor, characterized by spicy notes, is about just as pleasant as it is unique. Please note ! Limited time only! ‘Golden Flame’ Schwarzer Tee vereint die Verarbeitungstradtion yunnanesischen Golden Tips mit höchsten Qualitäts-, Umwelt- und sozialen Standards und dem Terroir von Xiengkhouangs alten Teebäumen. Der initialen Wahrnehmung süßer Kakao- und Rosinennoten folgen Anklänge von Orangenschalen und einer Reihe verschiedener Trockenfrüchte. Pflaumen, Feigen, Datteln… ein Universum der Geschmäcker, vereint und zur Sinfonie erhoben von einer alles tragenden Süße, die noch weit über den Genuss hinaus auf dem Gaumen verweilt. Kinnari’s “Honey Hill” is a youngunripened Pu Erh tea from ancient tea trees in Xiengkhouang, Laos. There, on Phousan mountain, the tea trees are still widely growing in their natural, biodiverse enviroment today. Even picking (1+2) and processing are still all done by hand in Xiengkhouang. The tea’s taste is characterized by sweet and poignant notes, reminiscent of honey and dried fruit, jacketed by a slightly astringent mineralic-green aura. Kinnari’s Xiengkhouang White Moonlight is an artisan arbor white tea from Xiengkhouang, Laos. 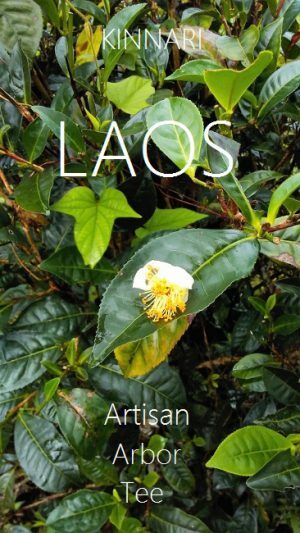 Within a time window of a few weeks only, it is picked with 1+1 picking standard from Xiengkhouang’s native ancient tea trees and processed according to ancient, Yunnan-inherited tradition. Its taste is characterized by a surprisingly full body of dried plums and raisins in the forefront. This is complemented in a subtle way by a the buds’ tendentiously nutty notes.